See the Microburst in action! It's simple, a fan blows air to fill a mattress, right? Experienced outdoorsmen require equipment that is simple, reliable, light and elegant. Camp-Tek's products solve real-world problems. Camp-Tek was founded by outdoorsmen, for you. Camping gear is our specialty and our expertise - we may be engineers, designers, marketers, and artists - but above all, we camp. What's your #1 issue on a camping trip? For most of us, a good night's sleep is the highest concern on an adventure. Conventional mattress pads are uncomfortable and heavy or they require tedious work to inflate. 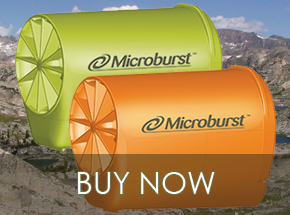 To solve this dilemma, Camp-Tek presents Microburst - the ultimate mattress pad inflator. Works with most mattresses using a protruding valve. Adapter is included for Stephenson’s Warmlite and Exped UL valves. Contact us for solutions to other mattresses. Mattresses typically inflate in 3 minutes or less. One set of AAA batteries will inflate a typical mattress more than 25 times. Weighs only 2.3 oz including batteries. Hygienic - No more blowing germs into the warm moist interior of your sleeping mat! Helps greatly reduce weight increase in down filled sleeping mats due to moisture absorption. Your breath contains much higher moisture content than ambient air. Designed to eliminate accidental operation when packed in tight spaces. Comes with convenient rip stop nylon carrying bag. Camp-Tek's Microburst is light to carry and inflates mattress pads quickly. "I took my new Microburst Mattress inflator on my last three ski trips and used it with both a Big Agnes and Exped 7.5. 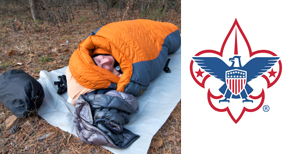 The Big Agnes has several disadvantages:...read more"
(regular size) in about 2:40....read more"
Enjoy sharing time with your son on scout camping trips, but don't like being uncomfortable sleeping on the ground? 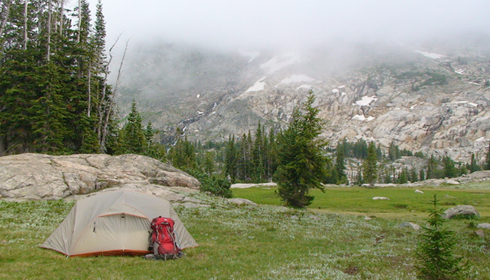 Get yourself a backpacking mattress and the Microburst from Camp-Tek and start enjoying the entire experience!